1. The GenoExplorerTM microRNA chip contains the most comprehensive probe content for microRNA profiling. GenoExplorer microRNATM chips offer the user the opportunity to perform differential expression analyses between different samples, not only for the mature miRNA, but also for the precursor miRNA. 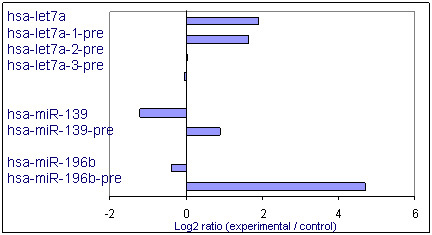 The graph shows log2 ratios of mean signal data comparing two different human RNA samples (experimental and control) for 3 sets of probes for both mature and precursor miRNAs. 2. The GenoExplorer™ microRNA platform offers a highly sensitive system for miRNA analysis. Eight synthesized bacterial RNA transcripts (30mer) were used for array hybridization. 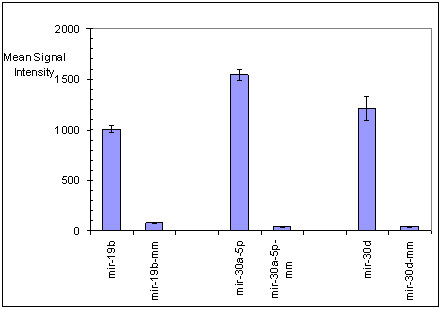 Spike experiment was performed with all eight synthetic RNA according to a predetermined spiking concentration matrix with a fixed amount of 2 ug total RNA samples to generate a real background on the array. The concentrations of the eight different spiking RNAs in each sample cover 3.5 logs. The samples containing different spiking RNA concentration are hybridized to different array chips. The spiking signal intensities were normalized against the signal intensity of the U6 positive control of each chip. 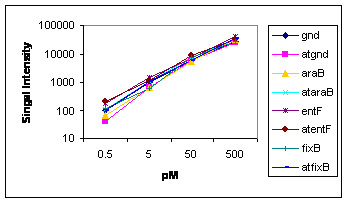 The result showed a low detection limit is 0.5 pM (equivalent to 10 attomoles) and a dynamic range of no less than 3 logs. 3. The GenoExplorer™ microRNA platform also offers a highly specific platform that can discriminate between sequences with up to 94% homology. The graph shows mean signal data for pairs of miRNA with single-base and double-base mismatches using human brain RNA. The first two pairs are single-base mismatches with 94% homology and the last pair is a double-base mismatch with a homology of 90%. All mismatches yield fold-changes greater than 10x. 4. The GenoExplorer™ microRNA platform yields highly reproducible results with an average CV less than 15% between experiments.